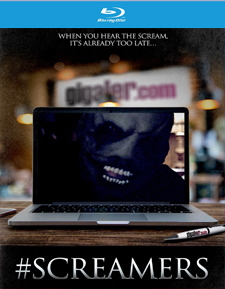 #Screamers is a found footage style horror film from 2016 about a group of people who work at an online video platform service called Gigaler. Their company is looking to boost its online presence and mange to do so when they post an anonymously submitted “screamer” video, which builds their popularity. The video shows a masked man popping up in front of the camera with a woman in the background who is apparently screaming, but when they attempt to follow up on who submitted the video in the hopes of getting the person or persons behind it to do more exclusive videos, they stumble upon a mystery that leads them down a dark and deadly path. While the initial setup of #Screamers shows some kind of promise, it’s unfortunately an idea that’s not paid off well. We spend much of the running time with the four leads in their working environment, basically discussing business and barely getting to know them, outside of what’s on the surface. On top of that, the final outcome for these characters is so badly executed that it leaves you feeling mostly unsatisfied. The idea of a found footage movie about online videos that may or may not be snuff films and a subsequent investigation into who is making them is an intriguing one, but the filmmakers just didn’t do enough with it, appearing to be over-reliant on the performances with a payoff for the build-up that makes it all a wasted effort. On the other hand, the film has a little more going for it in terms of getting you interested in it, whereas 2017’s The Monster Project is everything I hate about certain kinds of found footage films, which includes derivativeness, unlikable characters, and a godawful ending. It showcases a crew of documentary filmmakers who come together to make a new web series about real life monsters, but they get far more than they wanted when three of them show up and start attacking them. The characters consist of an unsympathetic lead, his loud-mouthed comic relief, a recovering drug addict, and a woman whose primary function is to be either the ex-girlfriend or a potential love interest. While the idea of an abuser on the mend attempting to overcome supernatural obstacles while battling his dependency is not necessarily a bad one, the execution of it here is entirely poor – even more so than its predecessor. He isn’t even set up as the lead at first, making his sudden turn and subsequent takeover a bit of a messy story device, ultimately leading to nothing more than an abrupt and infuriating ending. Then there’s the rest of the cast, offering up little else besides tired clichés. The only positive thing of note is a dream sequence of sorts, which is really the film’s highlight, even though it doesn’t really make much sense in context. Although fans of films like REC will no doubt eat The Monster Project up, it’s definitely more style than substance. The video presentation of #Screamers is a decent one. Shot digitally, it’s fairly flat but clean and clear throughout with good contrast and an average variety or colors. Black levels are good and everything is well-defined, although some portions of the film when the camera gets really shaky makes it more difficult to see anything clearly. The Monster Project, although shot fairly competently, is a little too clean and smooth, and also a bit too dark and shaky when the action starts. It’s not as colorful a film either, mostly filmed in the dark with very few textures or hues to offer. The audio for both films is presented in English 5.1 Dolby Digital with optional subtitles in English SDH. #Screamers is probably the least-interesting of the two, mainly because it takes place primarily in an office environment without much need for surround activity, and when it does require it, it isn’t all that impressive. The Monster Project, on the other hand, is incredibly active, particularly when the monsters start attacking. Dialogue on both tracks is mostly clear, aside from any aesthetic choices to not hear it clearly. Both films also come with their own separate set of extras. #Screamers includes an audio commentary by actor/co-writer/co-producer Tom Malloy and co-writer/director Dean Matthew Ronalds; 6 deleted scenes with optional audio commentary by Dean Matthew Ronalds; and the film’s trailer. The Monster Project includes an audio commentary by director Victor Mathieu, cinematographer and editor Phillip Sebal, and make-up designer Jim Beinke; the 45-minute The Monster Project: Behind the Scenes documentary; 9 deleted scenes; 11 episodes of the Smiling Man web series; and the film’s trailer. It’s also worth noting that the artwork for this release is reversible, with #Screamers on one side and The Monster Project on the other. Dread Central Presents continues its range of high class horror projects with both #Screamers and The Monster Project, two films that I have conflicted feelings about, but clearly enjoyed one more than the other. As always, these releases manage to give us a taste of what’s going on outside of normal horror channels. If you’re a genre fan, it’s a release that’s at least worth checking out.